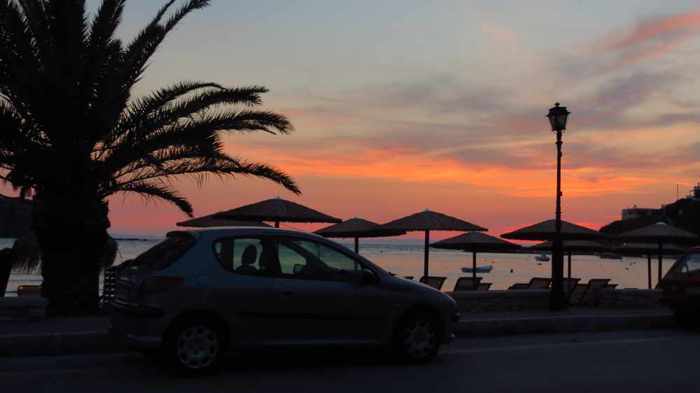 Most of Kini’s cafes and restaurants are situated along the beachfront, giving visitors the option to enjoy coffee or alcoholic beverages, as well as snacks, light meals and complete dinners, right on the beach itself or beside the sea. 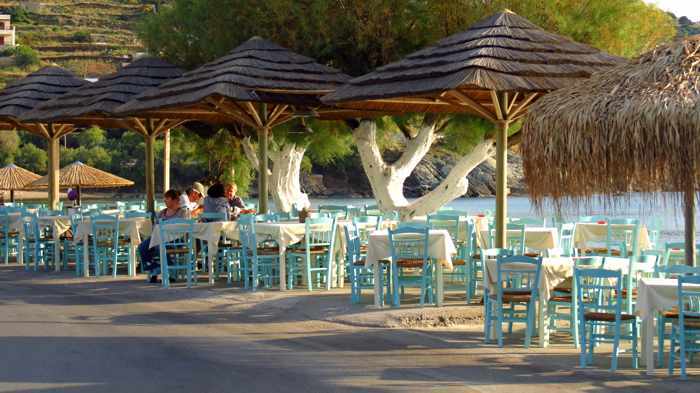 The village’s other eating spots are close by, just short strolls up the roads that lead to the beach strip. 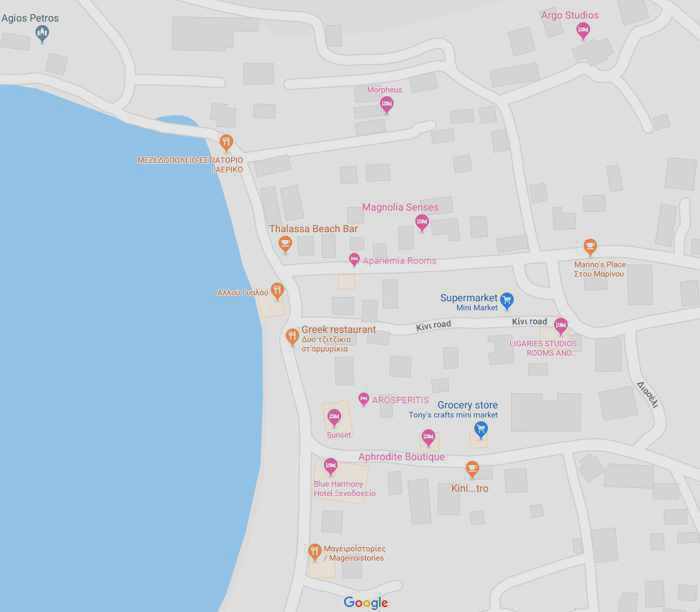 Below, in random order, are photos and descriptions of the various places where you can stop for a drink or bite to eat in Kini. 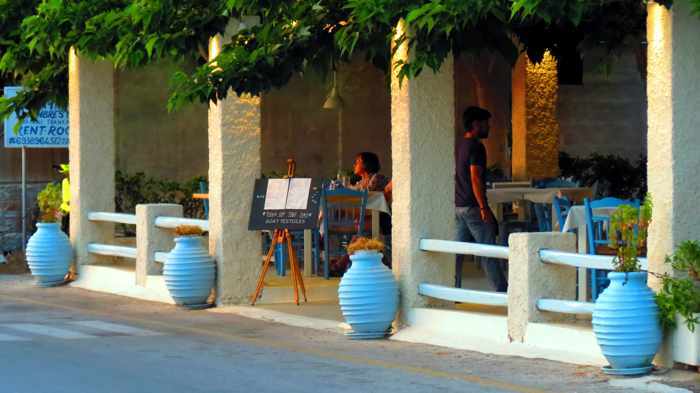 By far our favourite place to eat in Kini is Dyo tzitzikia st’ armyrikia (it’s actually one of our favourites from anywhere in Greece). 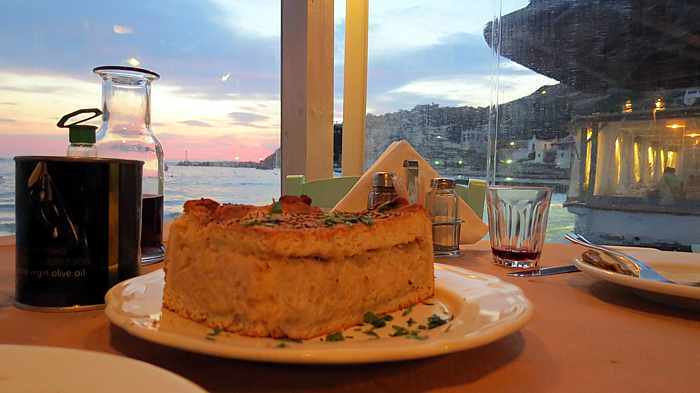 The reasons: great food, excellent friendly service, and superb seaside views. What more could we possibly ask for? We have had so many good meals here. 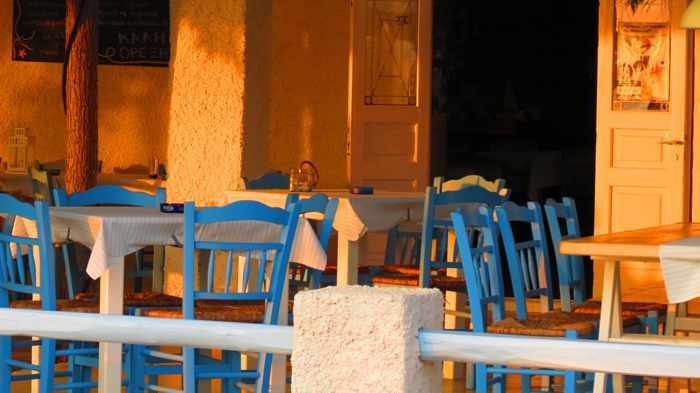 In fact, during our two trips to Kini, we ate dinner here more times than at all other village tavernas combined. 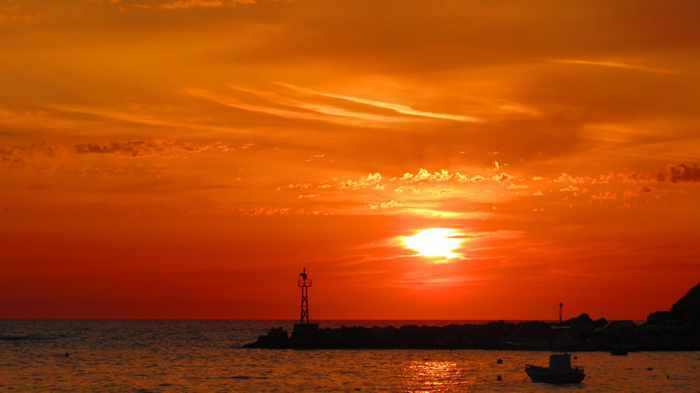 The staff were always cheery and welcoming, the service was efficient but unhurried, the food was always delicious, and the sunset views were wonderful. 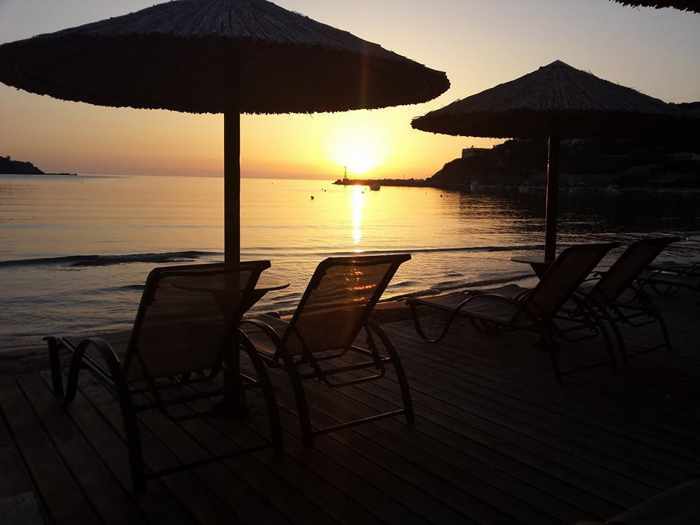 We always made sure we reached the restaurant in time to claim one of the tables right on the edge of the patio next to the sea so we would have the best seats in the house for sunset viewing. You can bet this will be the first restaurant we visit for dinner next time we stay in Kini. 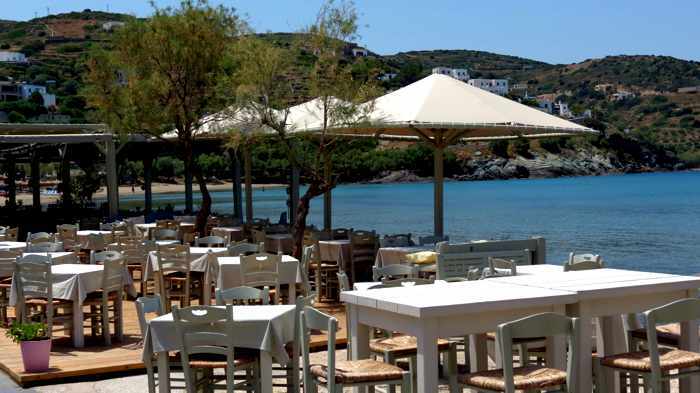 The menu and daily specials feature fresh fish and seafood as well as traditional Greek cuisine. 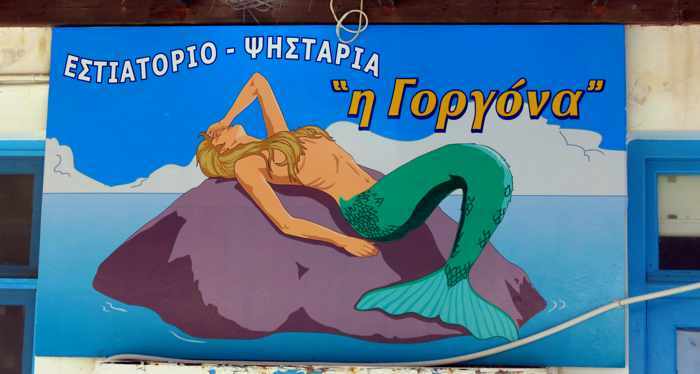 You can read what more than 350 other customers have thought in the Dyo tzitzikia reviews on TripAdvisor. A heaping plate of pasta and kokoras (braised rooster, a Greek version of coq-au-vin), and another with gemista and fries. 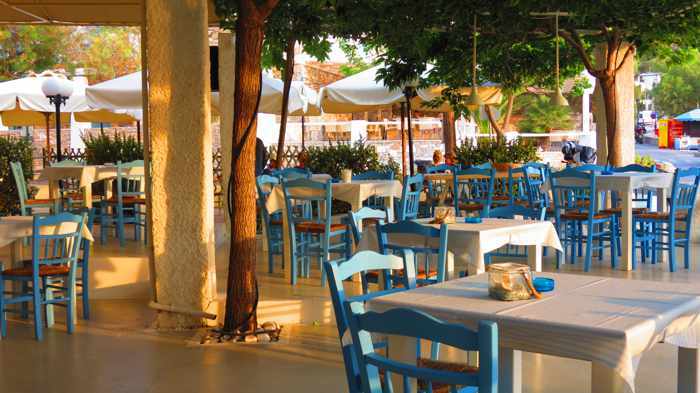 From our seats at one of the seaside tables, a view toward the main taverna building and kitchen across the road. 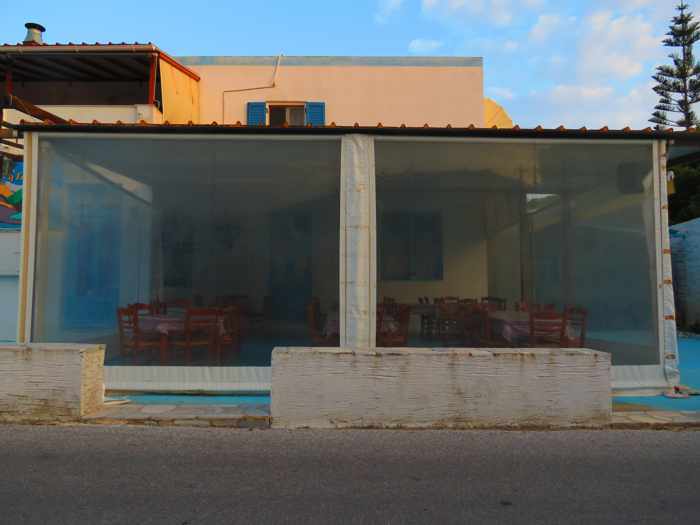 During extremely windy or wet weather, transparent windscreens shelter the taverna building’s front patio from the elements. 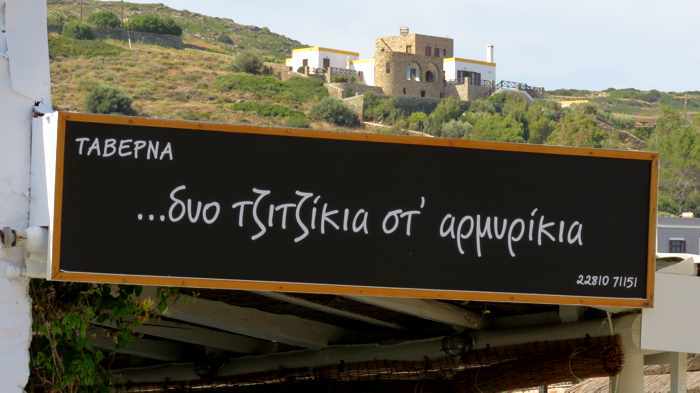 Kini is home to one of the most popular and highly recommended restaurants on Syros — Allou Yialou. 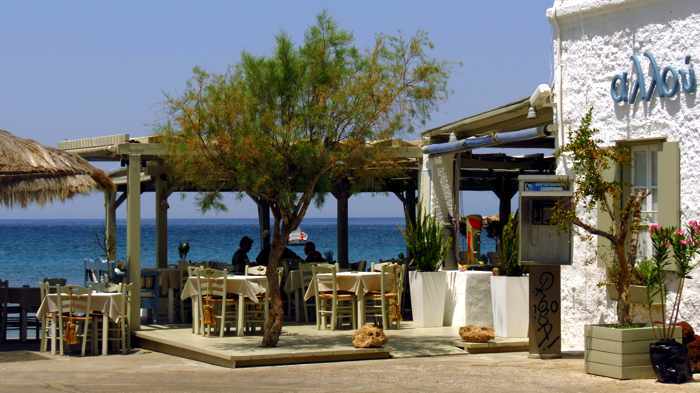 Situated on the seafront in the middle of Kini beach, Allou Yialou is regularly written up by international travel and culinary media, which routinely rave about the cuisine (creative, contemporary takes on traditional Greek and Mediterranean dishes) and rate the restaurant as either the best or one of the top places to eat on the island. It looks lovely, and its menu items and special dishes of the day are always very appealing, but it is the most expensive restaurant in the village and the prices are higher than we have been comfortable paying. But friends and other travellers have insisted the prices reflect the high quality of the cuisine, and have told us we’re missing out on a superb dining experience. 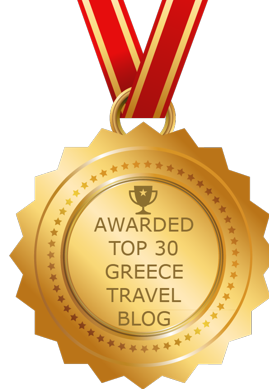 My very well-travelled blogging colleague, Marissa Tejada, has highly praised Allou Yialou, too, on her Travel Greece, Travel Europe blog. 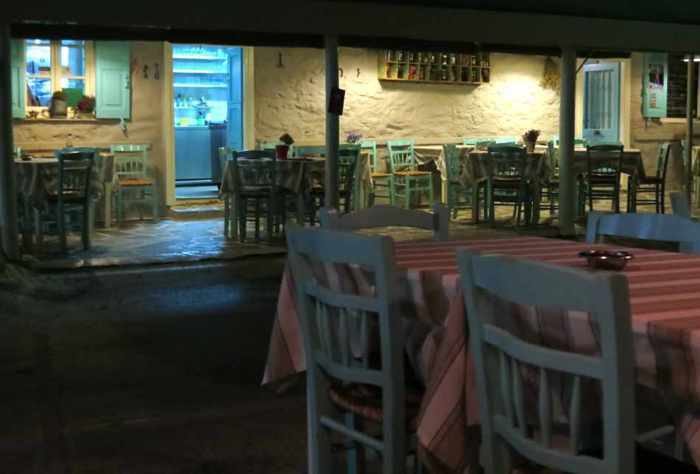 Be sure to take a look at her blog post Allou Yialou: A great restaurant in Syros, which describes a variety of scrumptious dishes she sampled. It’s accompanied by tantalizing food photos that will probably make you feel peckish. 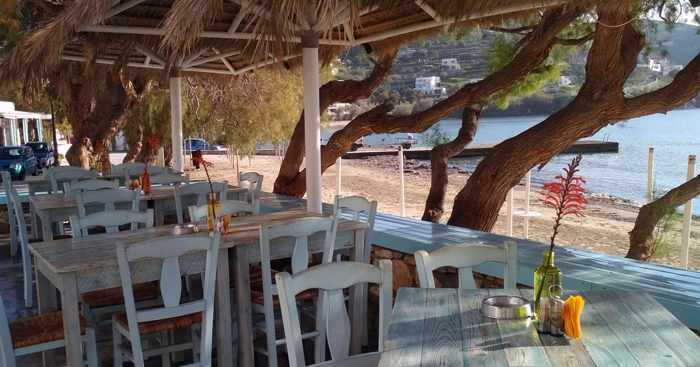 For additional comments about other customers’ experiences at the restaurant, you can peruse more than 800 reviews in the Allou Yialou listing on TripAdvisor. 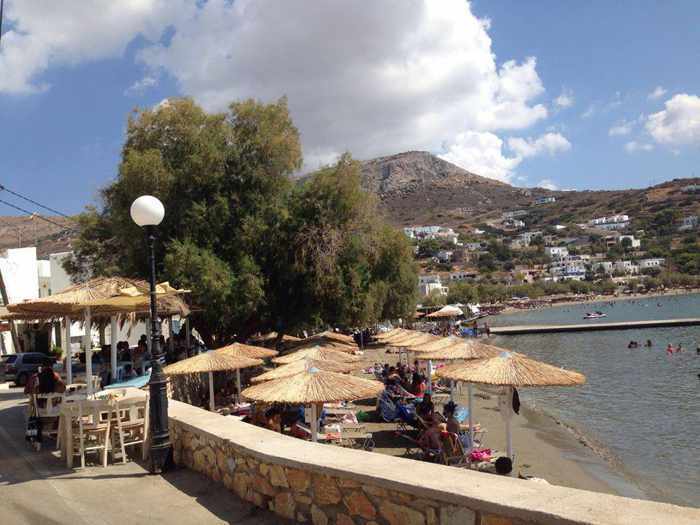 Below are two of our photos showing Allou Yialou’s seaside patio. Κινι..τρο wasn’t yet open for the season during our first trip to Syros, but the place was bustling the second time we stayed at Kini. 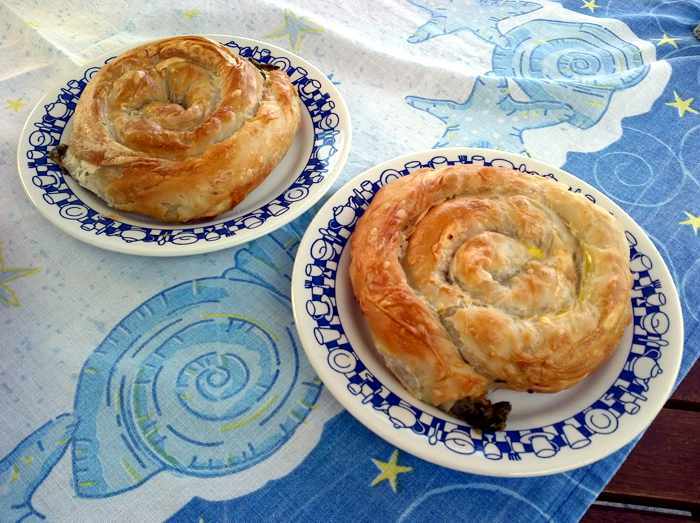 We stopped in one afternoon to have drinks and snacks, and learned from the owner that the kitchen opened early in the morning to bake spinach and cheese pies and other Greek pastries. So we we popped in three mornings that week to buy hot-out-of-the-oven pies to eat for breakfast on the garden patio at our accommodations. Twice we timed our arrival perfectly — the pastries were being removed from the oven just as we walked in. This was the first time we’d had tiropita and spanakopita fresh out of the oven, and they were divine! We also had one dinner at Kini Tro. 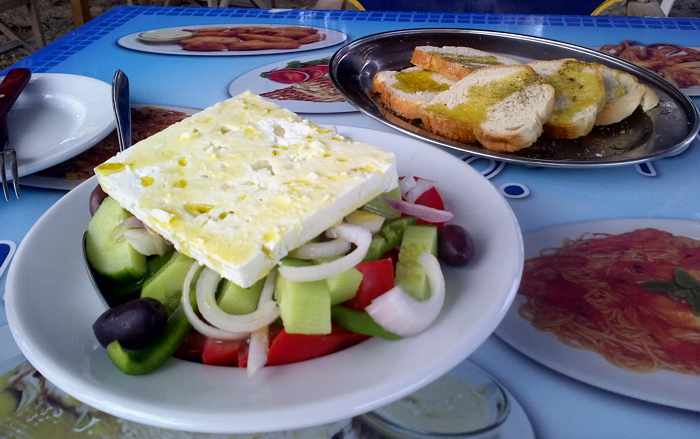 The cafe menu includes a variety of salads and appetizers as well as grilled meats and ποικιλίες (platters featuring a variety of grilled meats). Everything we tried was good — the “small” mixed meat platter we ordered was much larger and more substantial than we had expected; good thing we didn’t order the large! — and the service was always cheery. Kini Tro is open daily during the summer, and every day except Thursday during the off season. 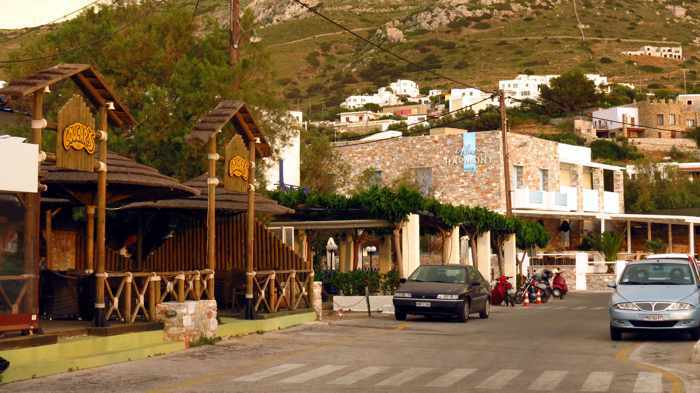 A road sign points the way to Aeriko, above, and a street view of the restaurant building and its streetside tables overlooking the beach. Both images are from Aeriko’s page on Facebook. 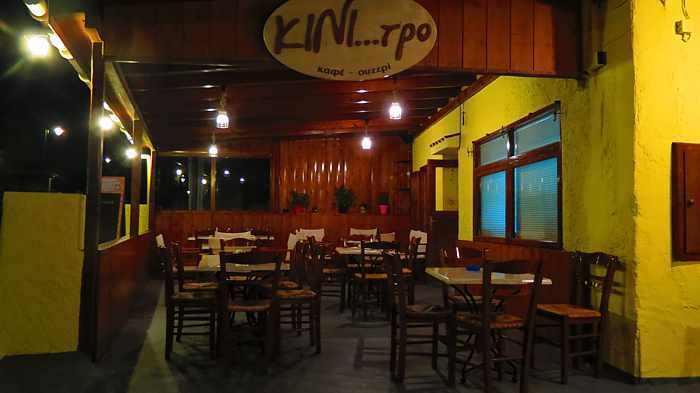 A recent new arrival to the Kini dining scene is Αερικό Κίνι mezedopoleio and tsipouradiko, which has opened at the north end of the Kini beach strip in the premises formerly operated by Ammos Kitchen and Bar. 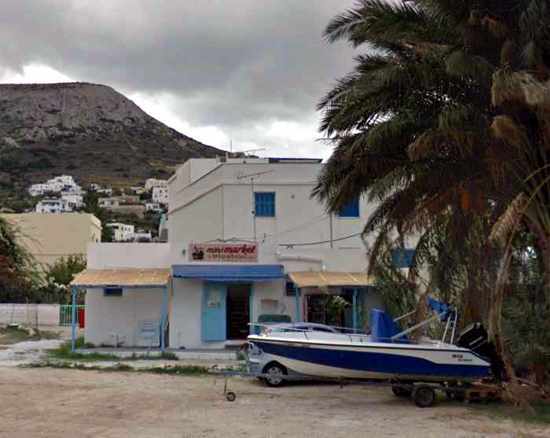 Although it’s fairly new to Kini, Aeriko isn’t a newcomer to Syros — it previously operated in the center of Ermoupoli from December 2012 to September 2017. Management tells me the restaurant then relocated to Kini and re-opened in its new seafront digs on December 1 2017. 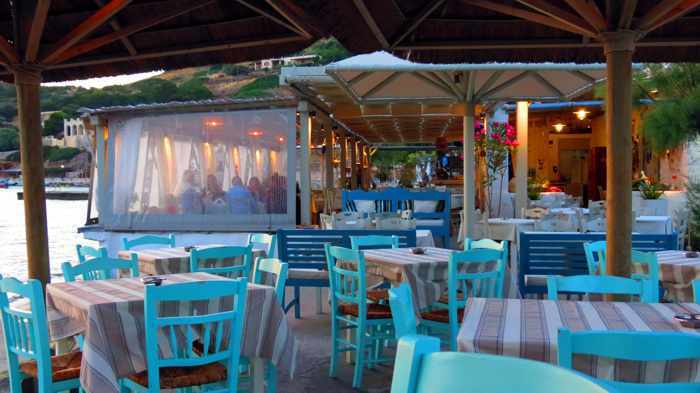 Aeriko has an indoor dining room as well as a row of tables on the street, overlooking the beach and bay (and offering a sunset view). Aeriko also operates a section of lounge chairs on the beach. 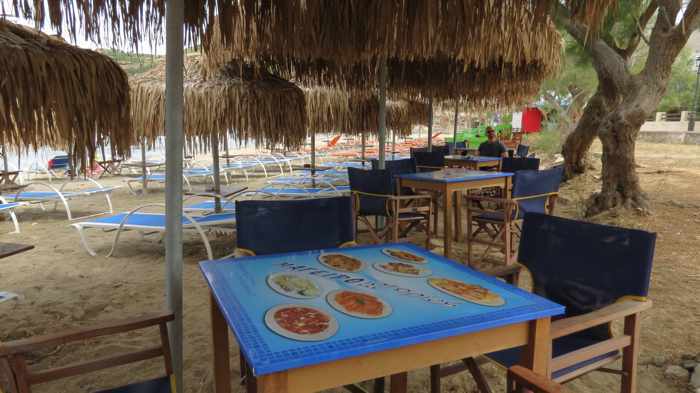 The restaurant does charge a fee for the sunbed rentals, but guests can order coffee, juice, other drinks and food to enjoy while they lounge on the seaside. 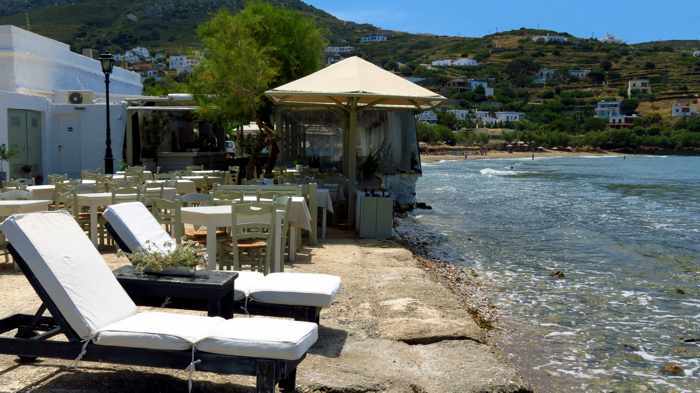 Aeriko serves meat, fish and seafood mezes (small plates) along with a selection of Greek dishes at reasonable prices, so visitors can sample a variety of items without spending a fortune. It’s a nice spot to stop for just a coffee or drink, too. 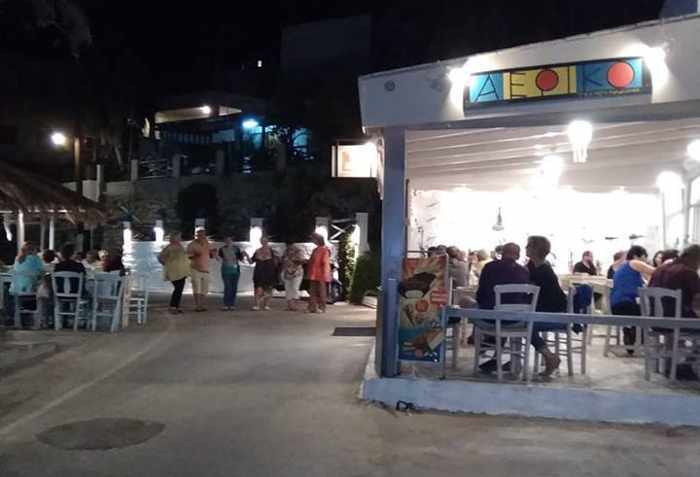 Aeriko has been open throughout the winter and has occasionally hosted live Greek music shows, so the place has often been packed with locals enjoying an evening of great food and entertainment. You can view dozens of photos of the restaurant premises and many of its dishes in albums and posts on the Aeriko Facebook page, which is updated frequently. Below are several photos from its Facebook galleries. 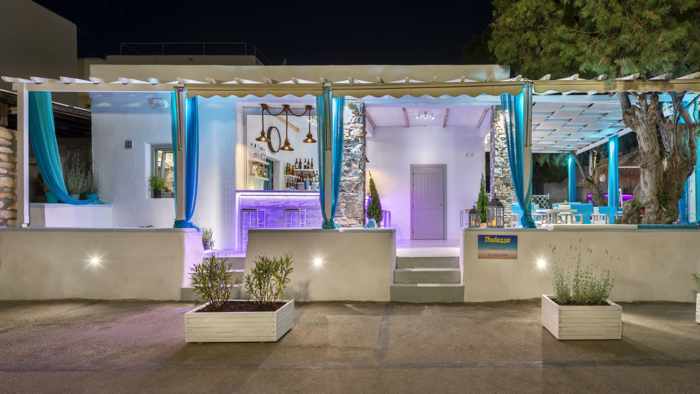 Another newcomer to the Kini bar and restaurant scene is Thalassa Beach Bar, which opened in May 2018 near the north end of the beachfront strip. 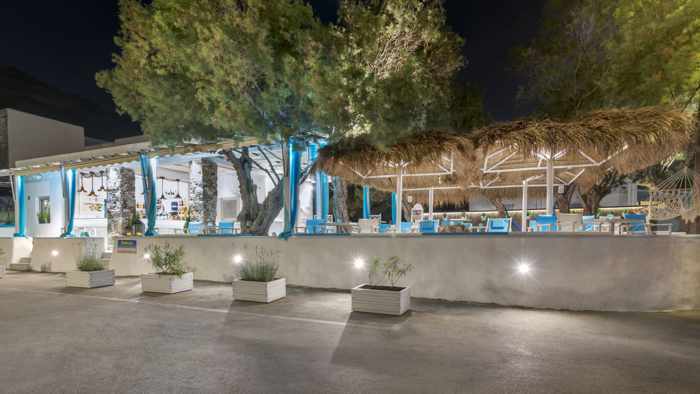 The street-side premises include a large open-air terrace shaded by trees, umbrellas and a pergola, just steps away from its organized lounge chairs and umbrellas on the beach. Thalassa opens at 8 a.m. to serve breakfast (until noon), and closes very late at night. Throughout the day it serves a variety of mezes as well as salads, hot and cold dishes, burgers, pizza, sandwiches and desserts (so families with kids will have plenty of food and snack choices). Food and drinks can be enjoyed either on the terrace or on the beach. Last summer Thalassa hosted a number of special party events, and presented live lounge music every Wednesday night. Below are two video slideshows of Thalassa’s premises and menu offerings. 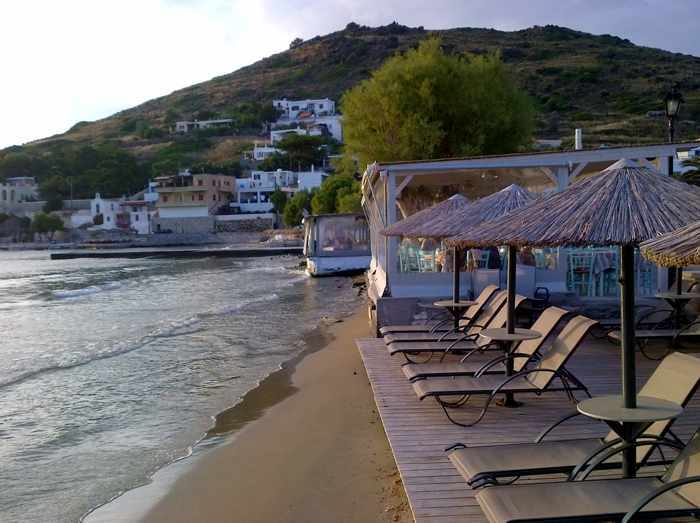 More photos can be found on the Thalassa Beach Bar page on Facebook. The Mageiro Istories restaurant building. I shot this photo from one of their tables on the beach, while we having lunch. 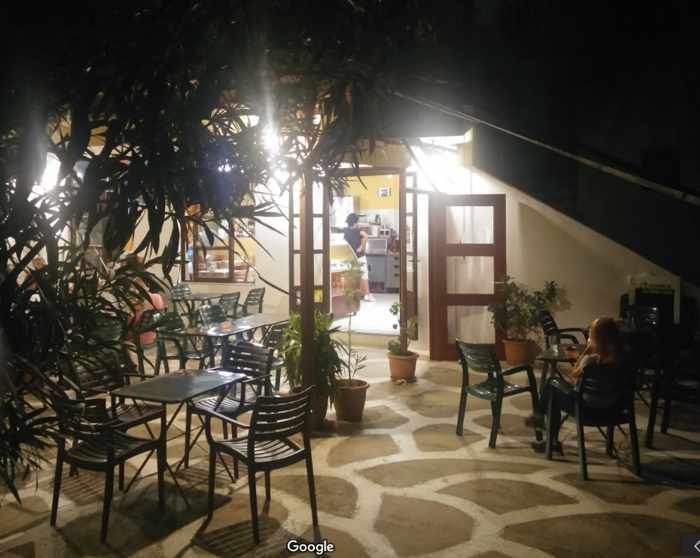 Situated at the south end of Kini beach, Mageiro Istories was our regular go-to spot for snacks and lunch, where we would relax in director-style chairs at one of their tree- and umbrella-shaded tables on the sand. We had dinner here once, too, but sat inside the restaurant building across the road for that particular meal. We liked their Greek salad (it was served with toasted bread brushed with olive oil and oregano), their fried potatoes, and their flogeres (small phyllo pastry “flutes” filled with cheese and ham), so that was what we typically ordered. 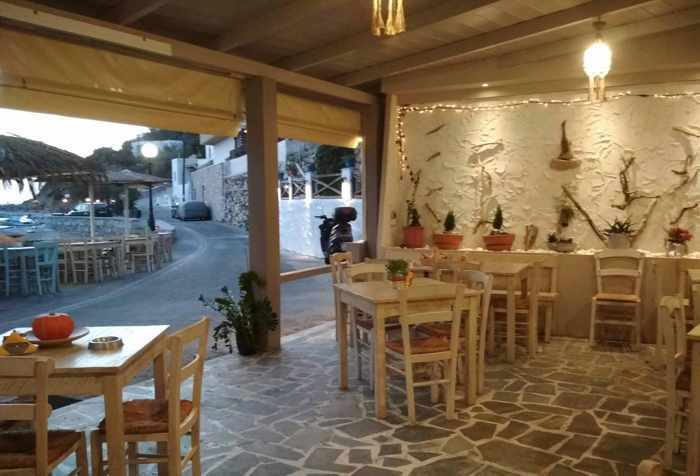 More than 20 reviews of the taverna can be found in the Mageiro Istories listing on TripAdvisor. 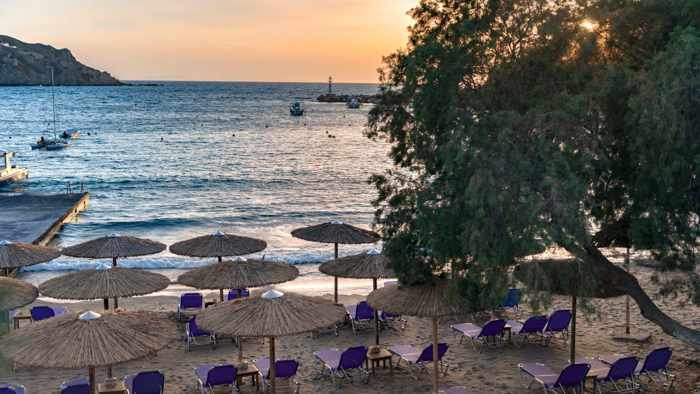 Stou Zaloni occupies the spacious ground-floor patio along the street front of the Sunset Hotel, near the center of the beach strip. We didn’t get a chance to dine there on our first trip to Kini, but did drop in for two dinners during our second visit. 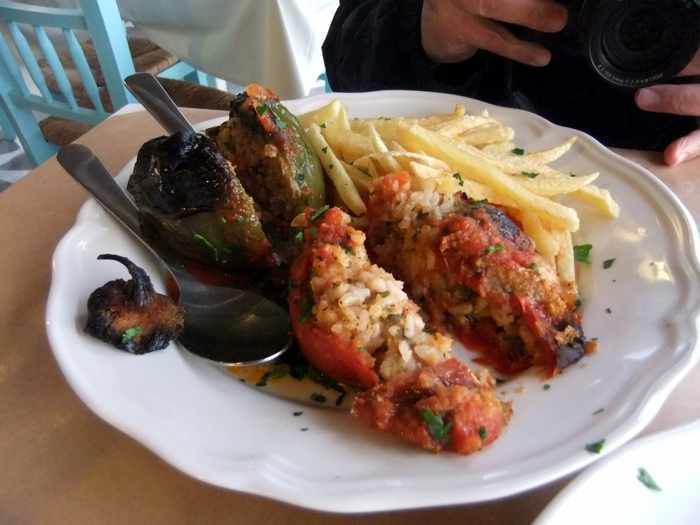 Stou Zaloni serves traditional Greek and Mediterranean cuisine, and we enjoyed everything we ordered on the two occasions we had dinner there, including their Greek salad, cheese-stuffed roasted peppers, kolokythokefthedes, and pasticcio. The restaurant has a menu, and posts special dishes of the day on chalkboards and a sandwich board sign at the patio entrance. What we particularly liked was arriving before sunset, since the terrace gets flooded with the golden light of the setting sun and has a very warm, soothing feel during that period. From our table we had partial views of the sunset; although vehicles parked on the road and umbrellas on the beach would block part of the direct sea view, we could always see the amazing vibrant sunset hues in the sky. You can view dozens of photos of the restaurant and many of its dishes on the Stou Zaloni Facebook page, and read more than 30 guest reviews in the Stou Zaloni listing on TripAdvisor. 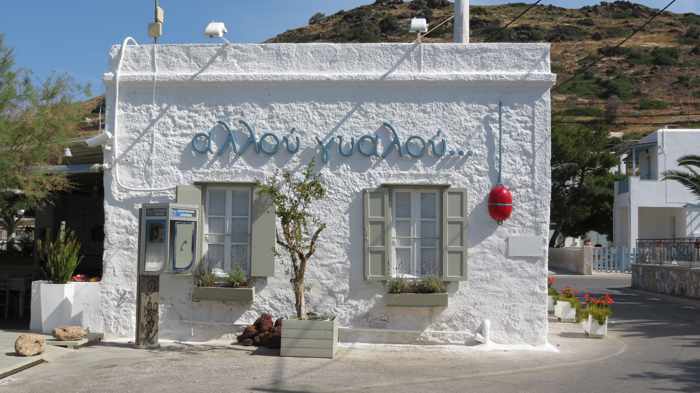 Marino’s isn’t a taverna, but mainly a bar that offers a small menu of Greek dishes at reasonable prices. According to a regular Kini visitor, the place is a popular hangout and watering hole for locals, and often is the last place in Kini to close at night. We popped by one evening to take a look around and see what food choices were available. As we had been told, there was a selection of fewer than a dozen food items that night, and most of the customers on the patio at the time were drinking frappes or beer, rather than eating. It seemed like a pleasant spot, but we never made it back to try the food. On our first visit to Kini, we never saw the Gorgona open for business. Its streetside patio was empty, so we assumed it had closed. 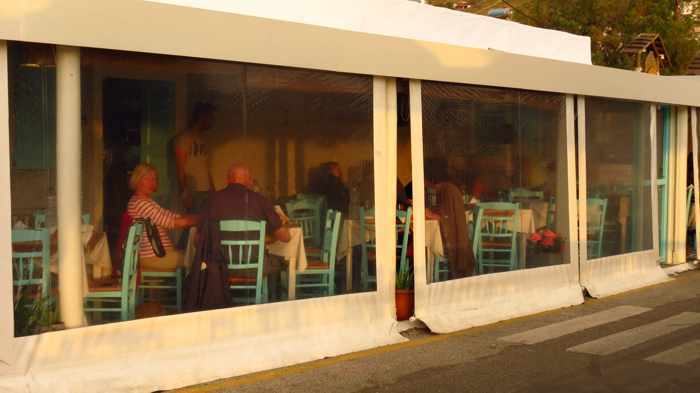 When we arrived in Kini on our second trip, it looked like the taverna was preparing to open — transparent windscreens were pulled down to shelter the three open sides of the patio from the elements, and chairs and tables with tablecloths were set up on the terrace (see the photo below). But during our week-long stay, we saw customers there only once. While walking past one evening, we were surprised to see the patio packed with people. There were no vacant tables, and it appeared to us that the place was open for a private event, since there seemed to be some sort of celebration underway. We went elsewhere for dinner, and thought we could try Gorgona another time. But it wasn’t open again during the rest of our time on the island. I later learned Gorgona has a very limited opening schedule. According to a TripAdvisor forum post by a traveller who visits Kini every summer, Gorgona opens only for dinner on Saturday evening, and lunch on Sunday. 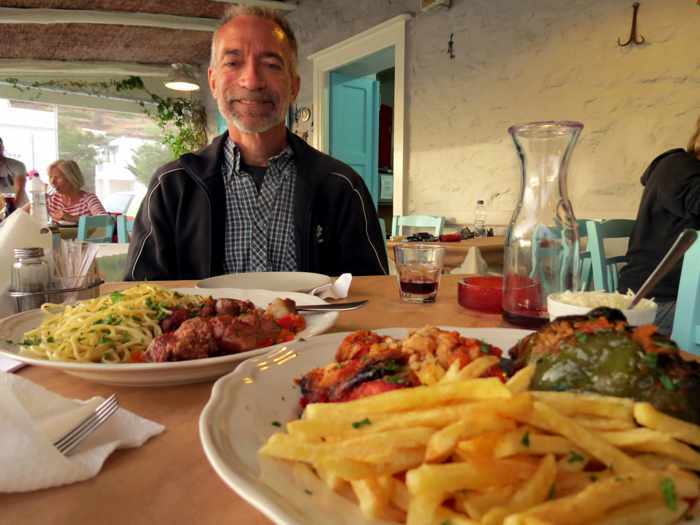 The menu is limited, but the Greek cuisine is very good, he said. 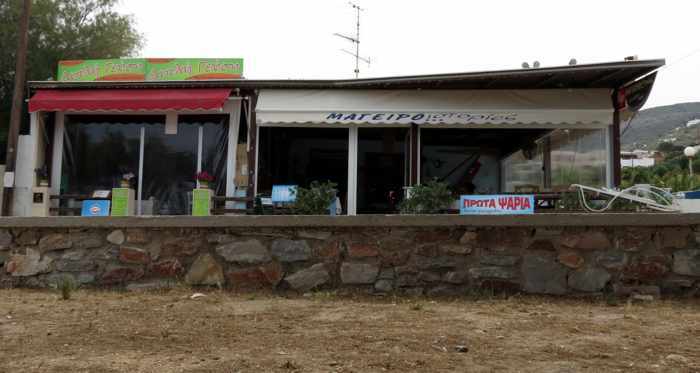 The owner and his staff apparently speak very little English, he added, but with sign language and help from local customers, people who don’t speak Greek will easily be able to order food and have a good time. 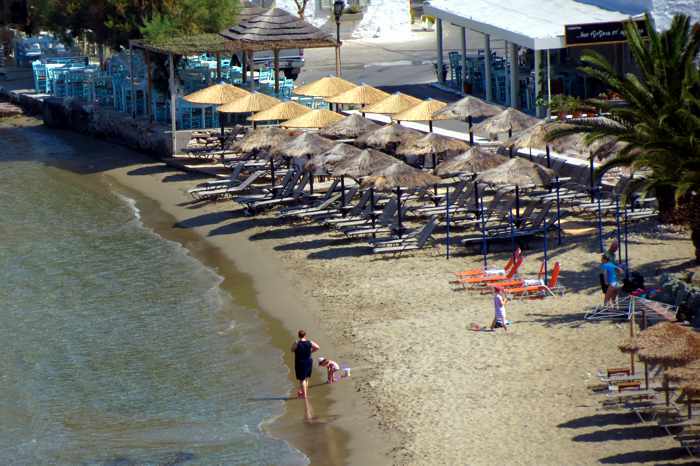 Cougar’s Cafe, left, is situated on the beachside road between the Sunset Hotel and Dyo Tzitzikia. We have walked past Cougar’s countless times, but haven’t yet been customers. The place is a popular beach bar during the day (it maintains lounge chairs and umbrellas on the beach across the road), and usually has been busy at night with visitors dropping by for pre-dinner cocktails, late night drinks or nightcaps. An online acquaintance has told me he has enjoyed chilling out with cocktails on Cougar’s sunbeds, finding it a great spot to relax either with the beautiful daytime beach and coastal scenery or the fab sunset views in the evening. He says the service has always been pleasant and efficient. Snacks and light food dishes are served on both the main bar terrace and on the Cougar’s beachfront. You can read more than two dozen reviews in the Cougar’s listing on TripAdvisor. 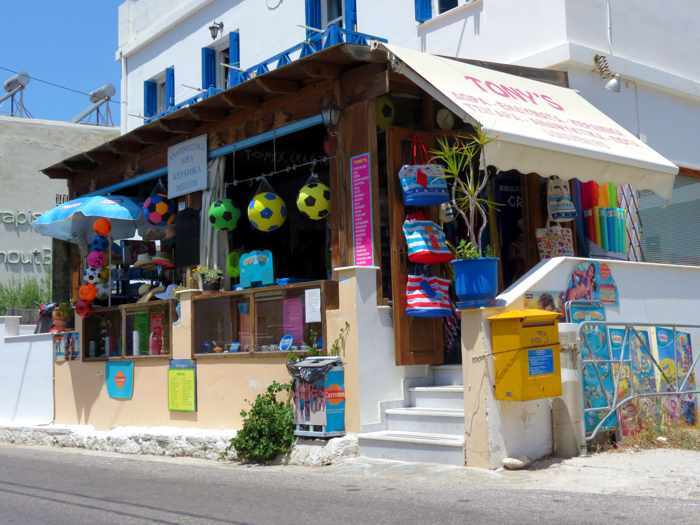 Tony’s Market is situated on the main road into Kini, next door to Aphrodite Boutique Hotel. Tony carries a selection of food, wine, beverages, household items, beach accessories and souvenirs. 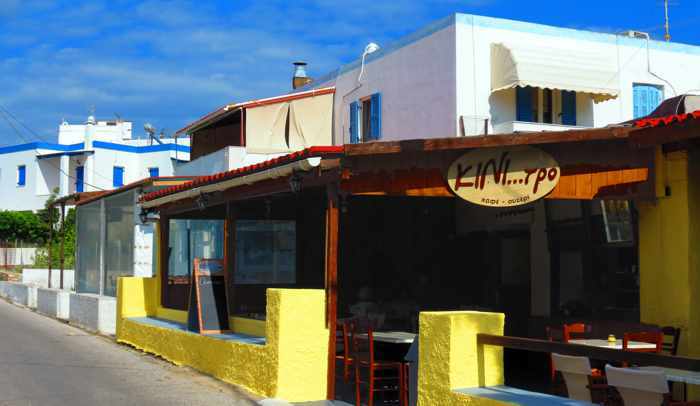 Kini Market is situated on a separate road leading to the beachfront. 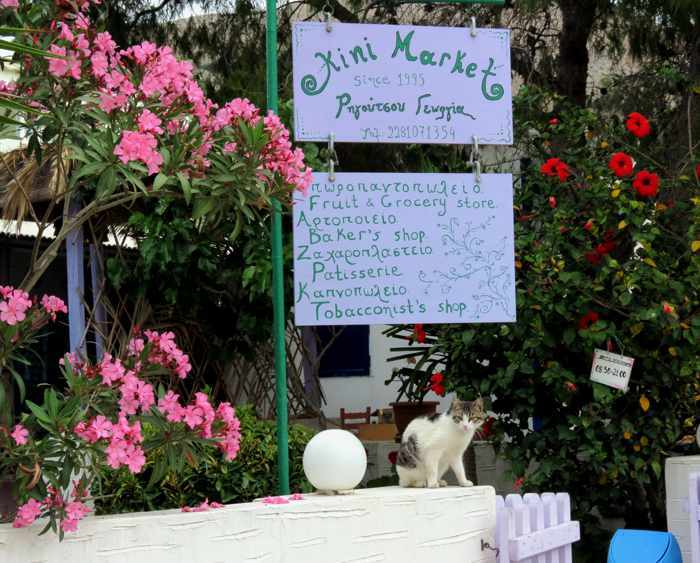 It sells fruit, vegetables, groceries and beach accessories, as well as fresh bread and other bakery items each morning. Even in low season the fresh bread sold out quickly, so we would have to make sure we got there early if we wanted to buy some for our breakfast and lunch. Google photo of the το Μπακαλικάκι μας grocery store, which is situated beside the free parking area directly across the road from Kini Market. It carries a selection of fresh fruit and vegetables, as well as grocery and household items, snacks, bottled water and beverages. Please click on the link below to continue reading on page 4, where I provide descriptions and photos of many of the hotels and studio accommodations in the Kini village area.